The Federal Aviation Administration wants drone enthusiasts to respect certain air space with Drone No Fly zones. Drones are not allowed to fly over private areas such as stadiums and federal buildings without written consent. This type of No Fly Zone Sign is being mapped and you can even enter your property address in the "Private No Fly Zone Database". You can use this record to prevent or protest unwarranted searches of your property by a drone. Protect yourself, your rights, your property and family. 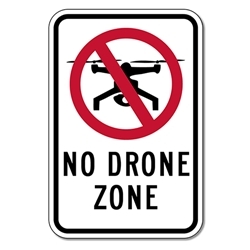 DOUBLE the working life of your No Drone Zone Signs by adding 3M Protective Overlay Film (POF)! 3M’s high-tech POF protects sign faces against fading caused by the sun and harsh weather—and makes graffiti and sticker defacement damage easy to clear away without harsh abrasives.